This is a rare microscope manufactured by Bézu, Hausser & Cie made just before Alfred Nachet acquired the firm in 1896. It is interesting in that it appears to be an intermediate between the microscope form of Oberhauser et al company and the newer Nachet forms. The general construction of this microscope in the Golub Collection is neither like the microscope illustrated in the 1892 Bézu, Hausser catalogue, or the microscope featured in the 1898 Nachet catalogue. Thus, this microscope seems to be an intermediate form between the older, defunct Oberhauser firm and the new Nachet firm. It is therefore a key-microscope in the history of Nachet company, and also in the long history of Oberhauser-Hartnack-Prazmowski-Bézu, Hausser & Cie company. According to A. Piffault, this instrument is the only Bézu, Hausser & Cie microscope that is signed without the name of Hartnack and Prazmowski; which may indicate that it is a very late production of Bézu and Hausser, just before the Nachet purchase. The microscope is stored in an original case which is very close in form to the Nachet wooden traveling box, but very different from the other Bézu and Hausser wooden cases (normally in the style of Hartnack). This may be because either the Bézu/Hausser company, at the end, started to copy Nachet, or because this microscope was in the stock of Bézu/Hausser when Nachet bought it and was finally sold by the Nachet firm in one of his “Nachet” cases*. 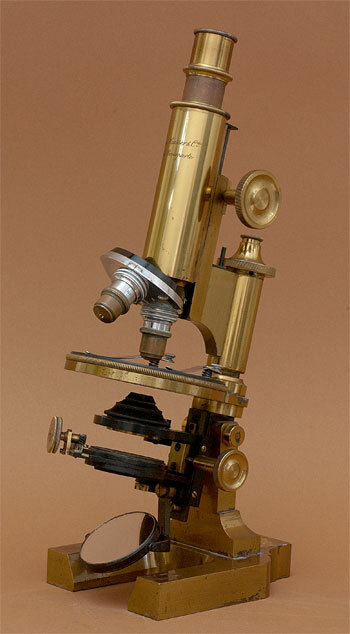 A classic Bézu, Hausser & Cie Microscope spécial is preserved in the National Museum of American History. The National Museum of American History has a classic Bézu, Hausser & Cie Microscope spécial microscope. This is a compound microscope that is supported on a lead-filled horseshoe base. The main support is set with a compass joint that allows the instrument to be tilted to a comfortable position. The microscope body is attached to a cantilever that includes both the rack & pinion coarse focus and spring-loaded screw thread fine focus mechanisms. There are three Huygenian eyepieces that fit into a brass drawtube. At the base of the body is a three-position objective nosepiece and two achromatic objectives (the third is missing). The sample stage is circular and may be rotated. It is constructed of brass with an ebonite (rubber) surface. Below the stage is a complex condenser carrier. Closest to the stage can be placed either a condenser lens system or an aperture. Below that is a rack & pinion translating device that probably carried another condensing optic. The illuminating mirror has two reflecting surfaces: plane and parabolic. The microscope body is engraved "Bézu, Hausser & Cie, 1, rue Bonaparte. The microscope is 33cm tall and comes with a Nachet-style mahogany carrying case. 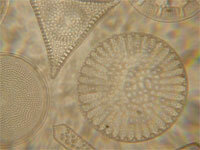 Imaging is very good and shows little chromatic or spherical aberrations. All images were taken by my indefatigable assistant Ms. Riley Maxon.